Where is the Capital of North Carolina? 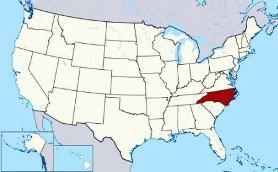 The Map of North Carolina State (NC) shows the location of the state capital in the "Tar Heel State". North Carolina has 100 counties, and the capital of the State is Raleigh. On a map, the capital city is always indicated by a star. Interesting fun facts about Raleigh including its history, location, county, current population, size of the city and the nickname of Raleigh, North Carolina. The Map of North Carolina and map provides an outline of the state, which covers 53,821 square miles. The size of the state's capital city, Raleigh, is 144.8 square miles. Test your recognition skills of the map of the state, and knowledge of its capital, with our State Maps Quiz Game. The location of Raleigh is in central North Carolina. The city is located in Wake county, North Carolina. Each of the 50 states have their own capital city. The city of Raleigh is the capital of the state of North Carolina. The capital does not have to be the largest city in the state, but is usually centrally located either geographically or by population. Fact 3: The population of the capital city is 423,179. Due to the many of oak trees in the area, the city is widely known as the "City of Oaks". Fact 7 on History: Raleigh was founded in 1792 and was to become an important cotton and tobacco trading center. Fact 8 on History: It was selected as the state capital in 1788 and the city was laid out in 1792. Fact 9 on History: During the Civil War (1861-1865), the Union General William T. Sherman occupied the city on Apr. 14, 1865. Fact 10 on History: The first state capitol building was built between 1792–94 but it burned down in 1831 and was replaced by the present building, that was completed in 1840. The number of people, or the population of the capital city of Raleigh, obviously changes constantly but the government statistics for the 2012 population of Raleigh was 423,179, which provides a good indication of the number of inhabitants of the city. We hope that the interesting facts and information about Raleigh will help kids and school children with their homework. Learn more by playing the States and Capitals Game. Raleigh Nickname "The City of Oaks"